Lowcountry Orphan Relief is able to meet the needs of thousands of children each year because of your generosity. Any amount is greatly appreciated. 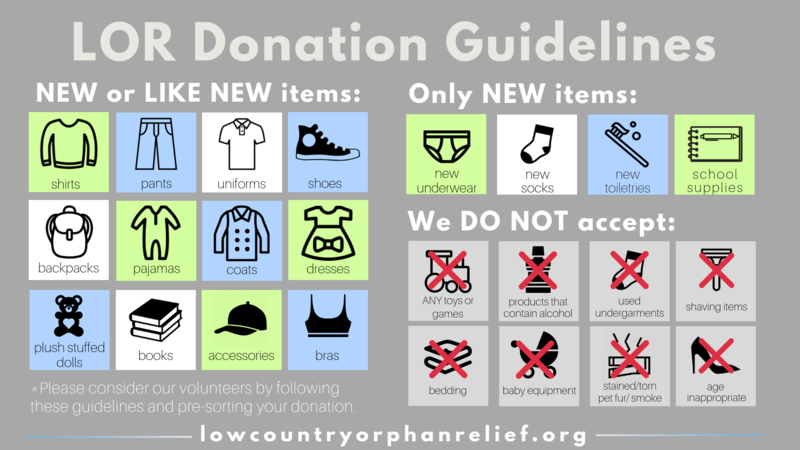 Checks made payable to Lowcountry Orphan Relief can be mailed to Lowcountry Orphan Relief, PO Box 70185, North Charleston, SC 29415. Please contact our Director of Marketing & Development by emailing sheilagh@lorkids.org for more information about making a major, stock, planned gift or for more ways to give. Donate Necessary Clothing & Toiletry Items - Please, no stains, tears or outdated clothing! The Lowcountry Orphan Relief Distribution Center in North Charleston, Monday-Friday between 8:30am-4:00pm. Call 843-747-4099 if you need directions. You may also drop off items at any of the Neighborhood Captains’ homes. Please click here to see the various locations.